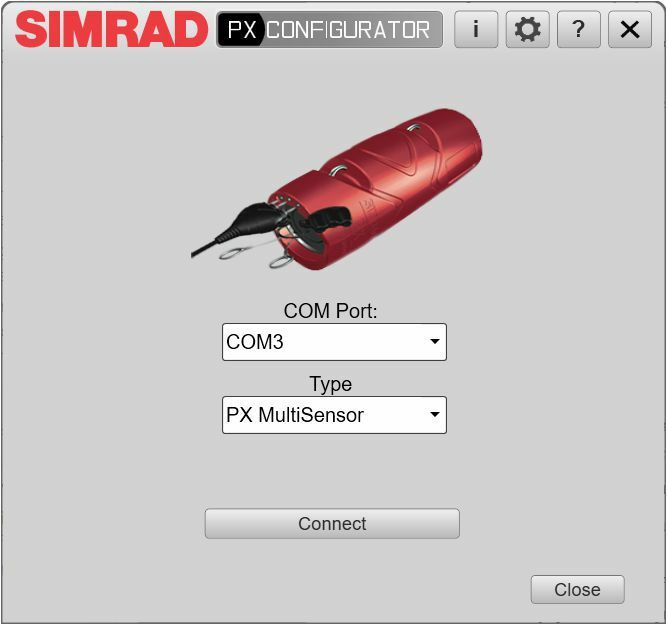 The Simrad PX Configurator program is a utility needed to setup Simrad’s latest PX catch monitoring sensors so that they can operate together or with other type of catch monitoring sensors. The PX Configurator is a tool developed mainly to configure the catch monitoring sensors that are going to be read by a software different from the TV80 Software, for example the PI50 Software. The PX Configurator can also be used to calibrate the trawl doors on a remote place where there is no other calibration utility available, like for example the TV80. Catch monitoring sensors are delivered from Simrad readily set up with common default settings. In some cases, you may find that the default parameters do not suit your operational needs. This is for example if you have more than one sensor of any given type. The decision to configure a sensor is one you must make depending on how many sensors you use, and how many of these are identical. Dedicated dialog boxes are provided to configure the new sensor. Note: The PX Configurator only allows you to configure PX sensors. If you wish to use older sensors (not PX family), these must be configured using their dedicated applications before putting them to use. The user interface comprises several “stand-alone” dialog boxes. Depending on the type of sensor connected, different dialog boxes with dedicated parameters will be used to perform the configuration itself. The configurator parameters allow you to set up which measurements the sensor shall make and which communication channels it shall use for these measurements. Sensor configuration is normally performed by authorized Simrad technicians. However, individual with basic computer skills and access to the necessary equipment should not find it difficult. The programming cable is included in the PX catch monitoring sensors standard delivery. The end-user documentation is provided as context sensitive online help in the PX Configurator utility.